Early this month, the folks at the Washington State Fruit Commission sent me an 18-pound box of dark, sweet cherries. Wonderful stuff – each cherry was huge and sweet and delicious, and – I’m proud to say – grown in Washington. You know what? 18 pounds of cherries is a lot of damned cherries. There, I said it. A few years back I was routinely processing 100 pounds of cherries a summer. I must be getting old, because this one box seemed to take me a two weeks to properly, lovingly tackle. But! Effort is rewarded, and the reward is good. 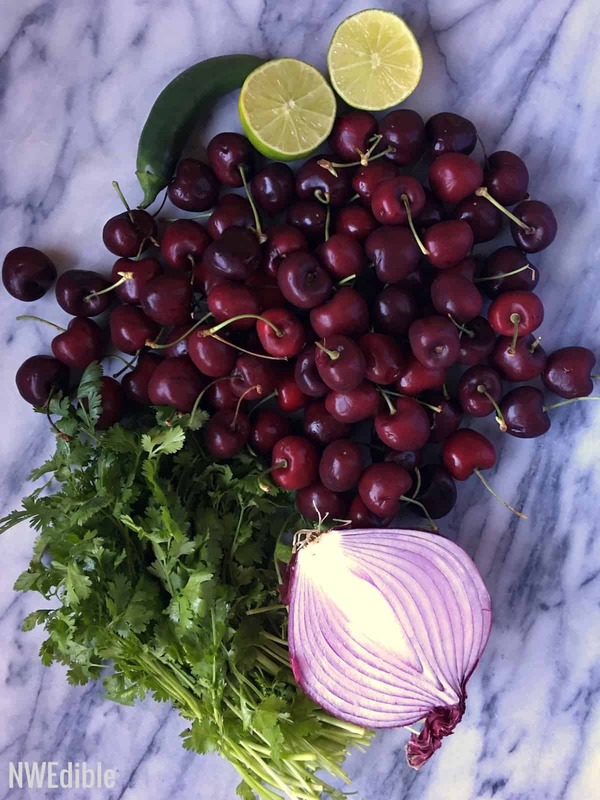 I made two batches of dark cherry and chocolate ice cream, Rittenhouse rye whisky-preserved cherries, cherry pit vinegar, cherry barbecue sauce and two batches of this cherry salsa. About the salsa. It’s simple. Direct, straight-forward, uncomplicated, adjective of your choice here. You know why? Cherries don’t need much. You add some onion, lime juice, a handful of cilantro, something spicy for kick. That’s all you really need. I guild the lily with a glug of tequila to bring out those alcohol-soluble flavors, but there are no complicated spice combinations here, no exotic techniques. It’s summer, simply. So get your cherries and let’s get to salsa making. Before you start, set up to water bath can your salsa. This recipe makes about 6, half-pint jars. 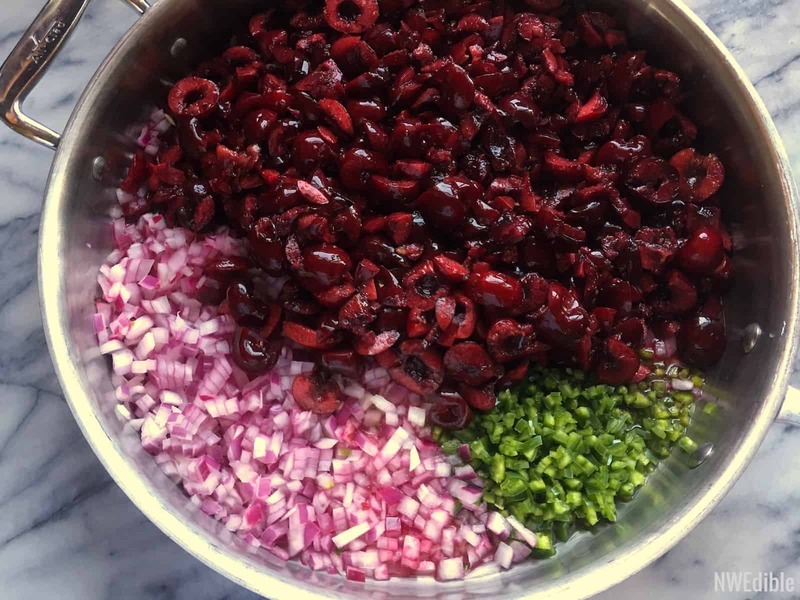 You’ll need 4 pounds of dark, sweet cherries, red onion, garlic, cilantro, the small, spicy chili of your choice, lime, tequila, brown sugar and salt. The choice of chili pepper is up to you. I tested two versions of this salsa. The first batch I made with a green serrano pepper, the second I made with a habanero. The habanero batch was better. But even one habanero lends a kick, so if you prefer a mild salsa, choose a more mild chili. Wash, stem, pit and chop up your cherries. 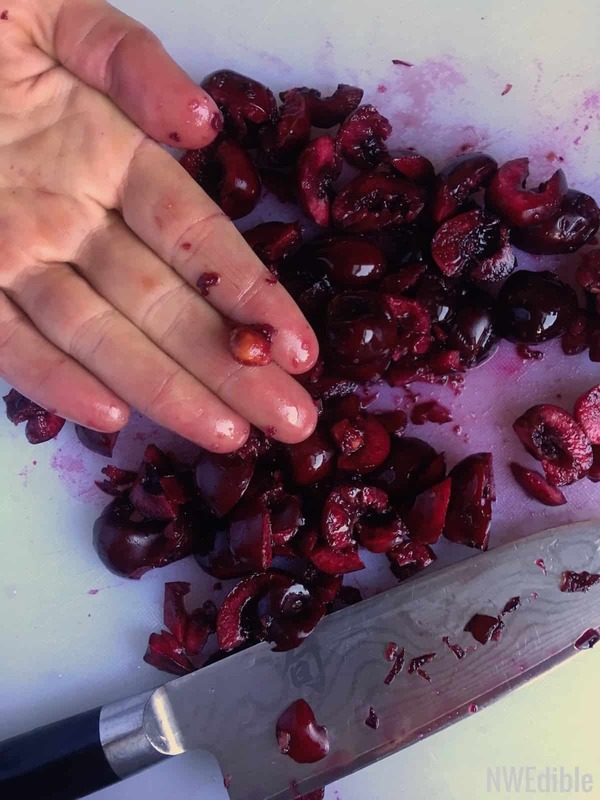 I recommend hand chopping cherries because if you miss a pit or two (I always do), they’ll find their way to the surface of the pile and you can pick them out. If you chop cherries in a food processor, there is inevitably one missed pit that shatters and turns into pit shards that contaminate everything. Not good. While you’ve got your knife out, dice your onion, seed and mince your chili pepper of choice, and chop a clove of garlic. Throw everything except the tequila, cilantro and salt a into a big, wide pan. Pan shape is important here: you want to be able to cook off extra moisture quickly, without cooking your salsa down to complete mush. Wider surface area = faster evaporation. Something roughly this shape is good. 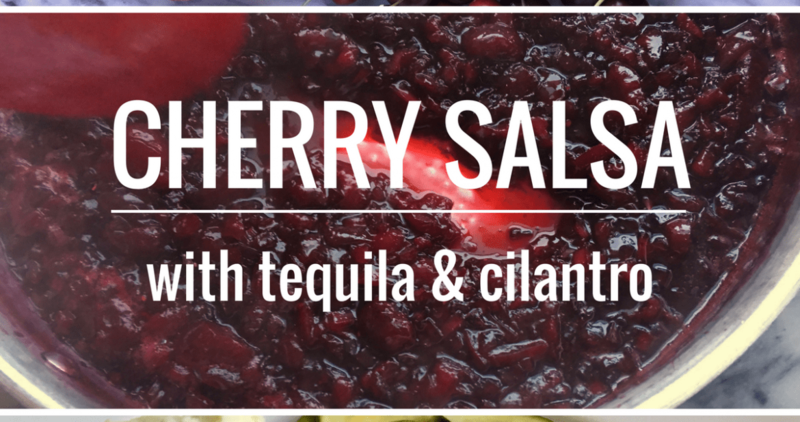 Cook your cherry salsa down for about 10 minutes, until it thickens considerably and turns dark and glossy. Throw the cilantro, tequila and salt into the salsa and cook until the cilantro is cooked into the salsa, about 5 minutes. Adjust your seasonings with additional salt, sugar or lime juice as desired. Ladle salsa into jars and proceed with standard water bath canning procedures. The All New Ball Book of Canning and Preserving – this latest edition of the Ball Book of Canning is excellent. Huge look-and-feel improvement over past editions. My Cherry Salsa recipe was adapted from an approved recipe in this book. Cherry Unboxing – Patreon – I think everything I made with my cherries was a direct suggestion or request from Patrons. Valicoff Farms – A family owned, Eastern Washington orchard. They deliver bulk boxes of seasonal fruit to drop sites around Puget Sound. Typically orders have to be finalized by end of day Wednesday for weekend drop off. Dark sweet cherries are $2.50/lb as of July, 2017. As a sauce for any white meat equivalent – chicken, pork, turkey, tofu etc. As a sauce for nearly any seafood – salmon, halibut, cod, shrimp, etc. With anything duck. Duck burgers, roasted duck, pulled duck sammie – if it involves duck, this salsa is a good addition. As a salad dressing base – just mix with a bit of olive oil and lime or orange juice. As a glaze for baked ham. As a spread on a vegetarian sandwich with cream cheese and lots of sprouts. 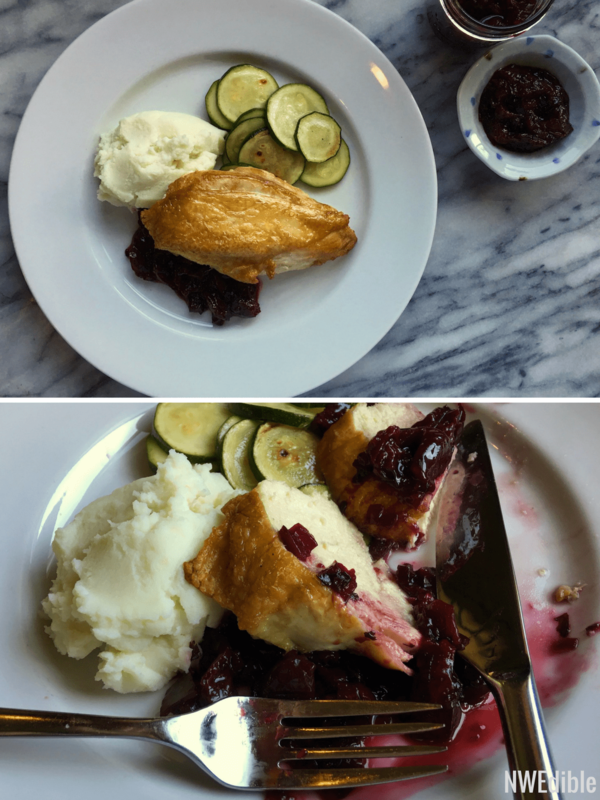 As an alternative to cranberry sauce. As a dip for chips or veggies – use the salsa solo or mix it with cream cheese or sour cream. As a ketchup alternative on for turkey, chicken or pork burgers. As a marinade for pork chops, tofu, chicken or seafood – add soy sauce and ginger to pull the marinade in an Asian direction, or add a tiny pinch of allspice, freshly squeezed orange juice and oil for a more Caribbean feel. If this is your first time canning, familiarize yourself with the process by reading this. Prepare your jars, lids, canning kettle and tools for waterbath canning with 6, 1/2-pint jars. Combine chopped cherries, red onion, garlic, chili pepper, lime juice, tequila and 3 tablespoons brown sugar in a large, wide, non-reactive pan. 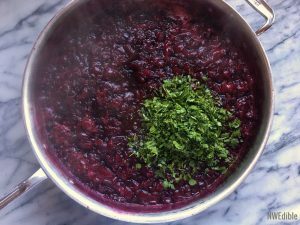 Bring mixture to a boil over medium-high heat, adjust heat and simmer for about 10 minutes, stirring frequently, until mixture has thickened slightly and looks dark and glossy. Add cilantro, tequila and salt and continue to simmer for 5 minutes, stirring frequently, until salsa is hot throughout. Taste and add additional brown sugar, salt or lime juice if desired. Ladle hot salsa into hot jars, leaving a 1/2-inch headspace. Wipe jars, set lids as directed by manufacture, and transfer to a boiling waterbath canner. Process jars for 15 minutes, adjusting for altitude. Turn off heat under canner and allow jars to sit 5 minutes in the canner. Remove jars from canner to a draft-free location and allow to sit undisturbed for 24 hours to cool and set seals. For a mild salsa, use a jalapeno or serrano chili. For a spicier salsa, use a habanero. Hi Neighbor! Can you do a post on making ice cream? And perhaps more importantly — your thoughts on ice cream makers? Can ice cream be made without an ice cream maker? We don’t have the space or desire for another kitchen appliance but we sure love ice cream! 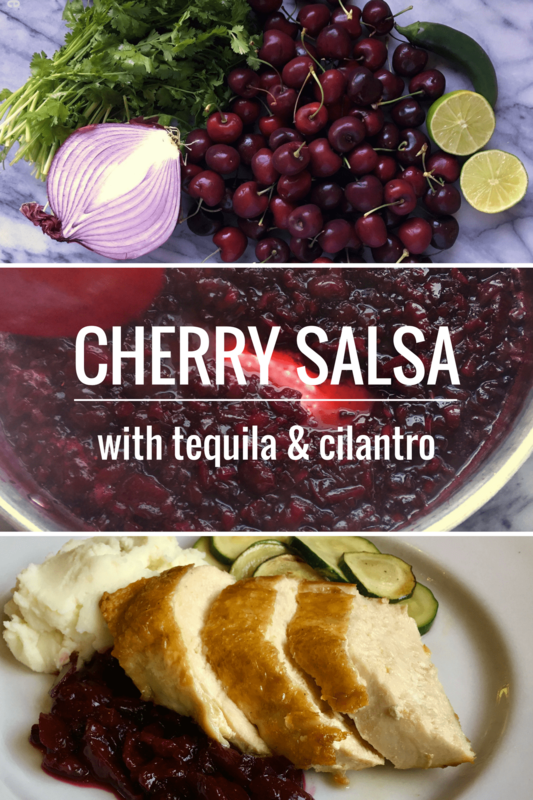 The cherry salsa looks wonderful! How do you make vinegar from cherry pits? That sounds really interesting! Donna, Google will turn up lots of ‘cherry pit vinegar’ directions… seems to basically be 2 to 1 by volume, white wine vinegar to cherry pits (whole, not cracked or crushed)… in jar in dark til you like the taste. I know nothing about canning. Can this recipe be frozen instead? After perusing the index, I broke down and bought the new Ball book due to the upgrades in the various savory sections. I’d already cut my jam-making back over the years, but this year I really crossed over whatever magical mid-30s age line that makes you want chutney over jam. Making this now! Just noticed you put to add the tequila at the beginning which I just did and then again at the end… I’m guessing it’s supposed to be at the end?